This is a very unique fire pit, I have used the center portion of the barrel to keep the symmetry of the original wine barrel shape. It is a great conversation piece in a Rustic elegant style. 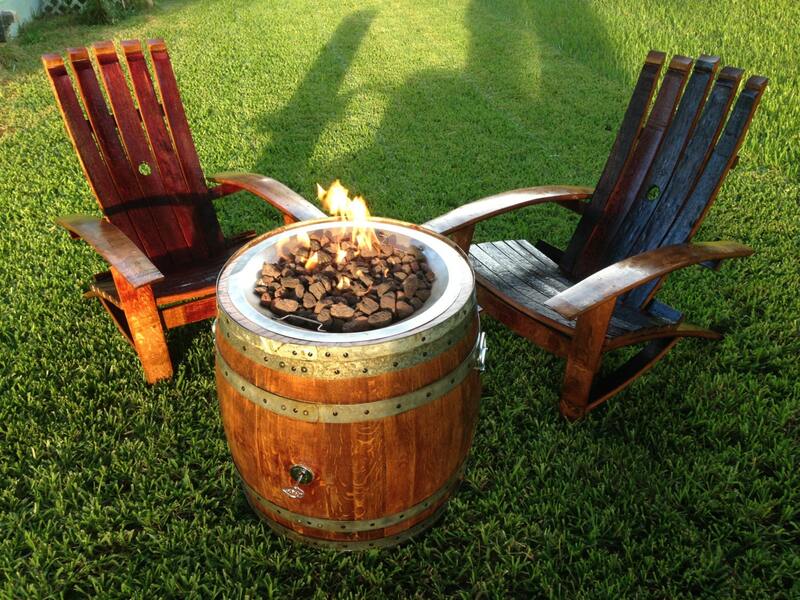 The fire pit is made from a recycled french oak Napa Valley red wine barrel. This wine barrel fire pit will last for a very long time and will not rust out like many of the metal fire pits on the market. The fire pit can be transported to any location that is suitable for its use. There are four 2" rubber wheeled casters on the bottom that roll easily on hard surfaces. In addition to the casters I have installed 2 trunk handles that make lifting the entire barrel easy. Take this fire pit to the lake, beach, camping, tailgating or any where else you like. The flames are fueled by a 20# propane tank that is stored inside the barrel. Access to the tank is made through a hinged door in the side of the barrel. The tank can be installed and removed in a matter of seconds. The burner pan is stainless steel. All hoses and connections have been properly fitted and leak checked at the time of shipping. A keyed gas control valve located in the stopper hole on the side of the barrel will turn on the gas supply and also allow you to adjust the height of the flame. The barrel has been stained a honey oak color and has been wiped down with a vitamin enriched wood conditioner. 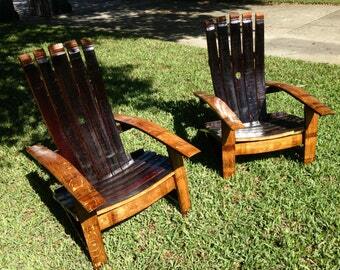 I DO NOT USE MARINE VARNISH AS IT WILL PEEL, DISCOLOR, AND CHIP OVERTIME. All the hardware on the barrel is made of galvanized metal and the screws are stainless steel. The propane tank is not included. The uses for this fire pit are only limited by your imagination. A WEATHERPROOF COVER AND 10# OF REFLECTIVE FIRE GLASS ARE INCLUDED. THE PROPANE TANK IS NOT INCLUDED. The overall height of the fire pit is 27 1/2" TO 28 1/2" and it is @ 27" wide. Weight with the tank and fire glass is 110 pounds. Wine Barrel Coffee Table Gas Fire Pit with Cork and Epoxy Resin Top and Raised Burner. The wine barrel fire pit is just perfect. Exactly what we were hoping for! This fire pit is a work of art! It is beautifully made & puts out a lot of heat. David is wonderful to work with & quickly responded to all my questions. Thank you so much! I highly recommend this seller. Excellent customer service. Beautiful workmanship and delivered as promised. Thanks David!